An article in the Times of India from a few years ago, talks of Chhatrapati Shivaji’s Bhawani Sword having originated in Toledo, Spain. This claim was supported (as a possibility) by none other than Babasaheb Purandare. 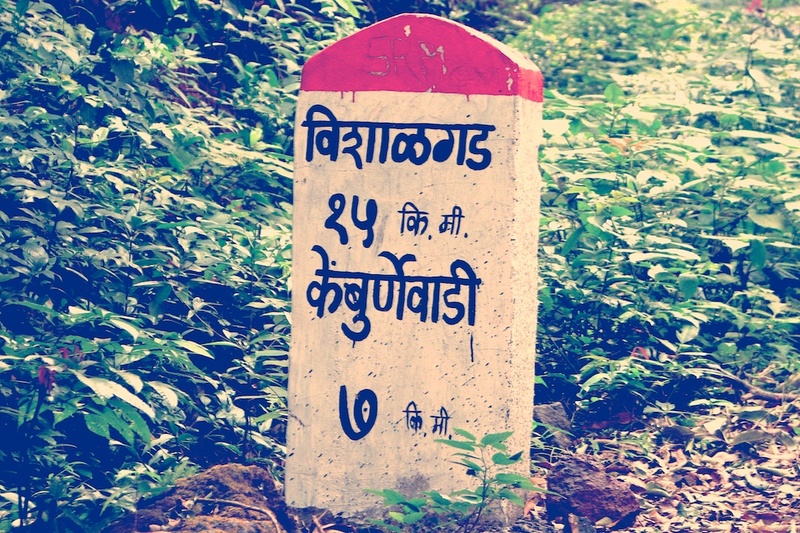 Ninad Bedekar, however, casts doubts due the inscriptions on the sword. What is the class (type) of the Bhawani sword? 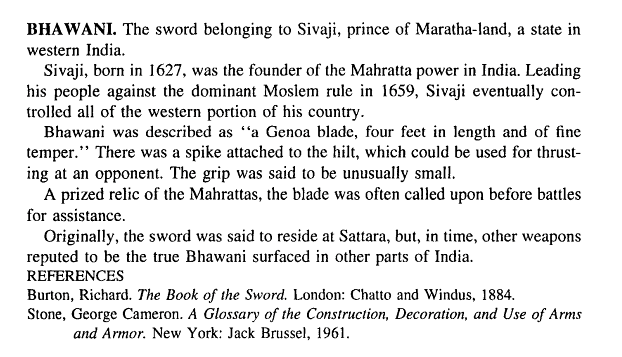 According to S. N. Sen, the Bhawani sword is a Genoese blade and the firangi, a Toledo Blade. There is more information about the Bhawani sword being a Genoa blade. If you look at some of the old paintings of Shivaji, it seems that the sword on his right arm was a Patta or a Dandpatta, which has an integrated gauntlet. However, if we go by the description of the Bhawani in the text above, by Nick Evangelista, it could not have been a Patta. The existence of a spike, means that there could not have been a gauntlet. 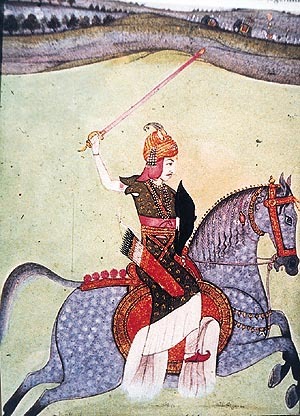 There are many such images of Shivaji, that often depict a Dandpatta in the right hand and another sword in the left; which looks more like the firangi (which a straight blade). So, while the blade itself was imported from either Spain or Italy, the class of the sword is an entirely different matter, because the sword was crafted locally. A distinction needs to be made between the blade and the sword, I suppose. As regards the Jagdamba sword, it is commonly assumed (and accepted, I guess) that the Jagdamba was gifted to Edward VII, the Prince of Wales, during his visit to India. It’s a badly cropped image, so there is no way to clearly state that this is a straight blade or a curved one. The Trust makes no mention of the name of the sword. Also, on the page, there are images of two swords. A look across various old illustrations of Shivaji, indicate the possibility of the Bhawani sword being a straight blade, and not a scimitar. Also, because I believe it is a gauntlet sword, there’s a good chance that it was a broadsword (double-edged). Yet, in contemporary illustrations, it is shown as a talwar or a scimitar (curved blade). Are these representations of the Bhawani sword or the Jagdamba sword? I’ll keep updating this page as I find new information. If you have anything to contribute, please suggest, using comments below. Sen, S. (1920). Siva Chhatrapati being a translation of Sabhasad Bakhar with extracts from Chitnis and Sivadigvijaya, with notes. (Vol. 1, p. 19). Calcutta: Univ. of Calcutta. Evangelista, N. (1995). The Encyclopedia of the Sword (p. 55). Westport, Conn.: Greenwood Press. I’ve been reading a book. It has captured my imagination and helped me understand a context of viewing history. I’ve not finished reading the book; by number of content pages, I am somewhere 17% in the book. Conventional and contemporary formulation of a war plan is based on “game-theory (numerically based, conflict analysis.) The author of the book, that I’m reading, uses the phrase, “Contemporary cultural arrogance of strategic assumption.” Some of us may find the phrase familiar. Early, in The Anglo-Maratha Campaigns and the Contest for India, by Randolf G. S. Cooper, there is context-setting for the book. Or, at least that is how I look at it. What role does cultural conditioning and cultural perception play in the formulation of war plans and the prosecution of war? In other words, linking your military response to assumptions about your enemy’s action’s (i.e. strategy and tactics) is dangerous if you come from a different cultural background than that of your opponent. If you wage war against an opponent from a different culture, it is never safe to assume that the ‘givens’ that govern your behaviour also govern those of your enemy. In a cross-cultural conflict, the assumption that the opponent will respond in a way that you would expect (in a similar situation) is dangerous, to say the least. When we adopt the line of this thought, we tend to ignore the cultural upbringing and therefore the compulsions of the opponent. Risk-perception and other similar qualities aren’t predictable, more-so because of disparate cultural, historical, and even geographical considerations. Distorted notions, or invalid assumptions of cultural comprehension of the opponent comes from dealing with “large blocks of time” that enables easier and, perhaps, faster analysis. These simplified explanations are easily peddled, comfortably absorbed, and lubricated without resistance, down generations. (As is obvious this process runs the further risk of over-simplification over time). Each side does this unfailingly and attempts (with varying degrees of success) to propagate and insert their version within the world view. Some of the recent and ongoing conflicts in the world today are a case in point. While the physical conflict continues, in such instances, a parallel conflict of continuous cultural conflict and misrepresentation continues to compete. When one side has complete dominion (e.g. the colonisation of India) over the other, the description and definition of the cultural ethos is owned by the oppressor. The oppressor works on it in two ways: one, to systematically put to death the original cultural ethos; two, by laying a thick shroud of a permanent propaganda of an artificial, oppressor-oriented identity. The oppressed then start believing, over generations, in the oppressor’s version of the cultural ethos of the oppressed. The reclaiming starts. The oppressor is long gone. But it is not always easy to reclaim reality from the rotting corpses of yesterday. History suffers, and becomes a victim of hollow chest-beating and rhetoric. History books are usually fun. Not all books, but most of them who tell stories well, and who tell them right. 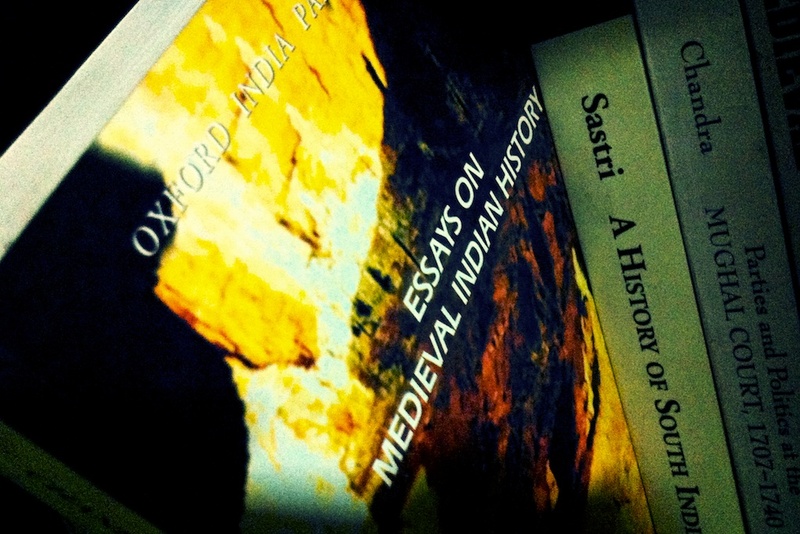 The more interesting books are about the history of history or the science of history, if I can call them that. And then there are books about the writing of history. I believe the short-term or the micro-history is interesting because of the specifics in the story. The big-picture histories are loftier, abstract to an extent, and perhaps not-so-interesting. It does not however mean that “big-picture histories aren’t important. The context of a micro-scale histories are equally important as the specific in it. In my study of the Maratha Confederacy I’ve been studying the histories of various confederacies around the world, and have been curious about the nature of how confederacies come in to existence, their character, and their eventual demise. While I don’t intend to write a book on history, it seems that the book may help me find a better direction to the manner in which I study history. I am looking forward to reading this book. In my opinion, this would undoubtedly be the most impressive project ever undertaken in the realm of History. Especially because the project does not attempt to create a singular view of history, rather, it just places them alongside each other for you, the student, to evaluate the two views. History as a concept as well as a subject has been subject to much maligning. This project and similar such projects (if they come up in the future) will help history reclaim its deserving position, not just in academia, but also for the curious mind. “In school, we learn that History isn’t like Maths. It isn’t a ‘scoring subject’. A two plus two will yield the same result all over the world, but history is subjective. It’s written by people, after all. People are subjective too; people find it difficult to not pick sides, a fact borne out by those history textbooks of India and Pakistan. The project page is here and the “textbook” can be downloaded here. [18MB PDF]. If you are willing to appreciate history without embellishment, opinion or colour, this is a definite read.